On Thanksgiving, I asked my grandma if she was good at making tree skirts. I had been looking and it is crazy how much tree skirts cost - even the cute ones at Target are $30-40. I know that's not terrible, but it's still expensive for something you cover with pretty presents! Plus, finding one that fits the look you want is not easy. Well, I was very surprised when my grandma said that she used to make her skirts out of tissue paper. Tissue Paper!? She started telling me about it and I loved the simplicity of it. She said when her children were younger, she would have a real tree flocked and then with her friend, pleat tissue paper for the tree skirt. I decided to give it a whirl. That weekend, she put together an example for me to make sure I understood how to pleat it - so cute of her. I loved the idea of making something like she used to - she was quite the home maker back in the day! Plus, I decided to use my childhood glass ornaments, vintage ornaments and red balls on the tree this year, so I loved the idea of a vintage style skirt. Turns out, it's pretty easy! Tree skirt for $3...I'll take it! Here are some more pictures of the tree this year - I went for a traditional look, with pops of color (the big globe lights!). I hope you like it - I'm sure my husband appreciates that the super girly ornaments from last year were left off. Side note - taking pictures of trees is beyond difficult, so sorry the pictures aren't the best. My mom gave me the Christopher Radko ornaments we had growing up and I was so excited to put them on the tree - they have such amazing detail and are so fun! Above are some of my favorites from our collection. If you are local and interested in Radko ornaments, The Plaid Giraffe has some fabulous ones. To go with these ornaments, I searched on Ebay and found some vintage Radko Shiny Brite Ornaments - $20 for a set of 16! 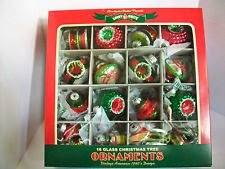 Ebay is a great place to search for vintage Shiny Brite ornaments if you are interested in finding some for yourself. Hope your Christmas decorating is going well! We still have a little more to get done, but we are getting there. Love this time of year! 2nd Craft Fair Recap & Shop News! Little Boxes of Christmas Character!